Decorate your bed or couch with this cushion covers, and augment the unique style of your room in an instant. Bring a stronger Halloween flavor to your home. Size: 45 * 45cm/18 * 18in. Apply to: Sofa, chair, bedside, etc. PER PILLOW COVOR SIZE - 45cm x 45cm x 45cm (18*18 *18in. ). Great quality and super adorable. MATERIAL - Made of 100% Natural Cotton Linen and Eco-friendly Fabric. High quality, a great gift idea to your family and your friends. HALLOWEEN FAVORS - Halloween home decoration. 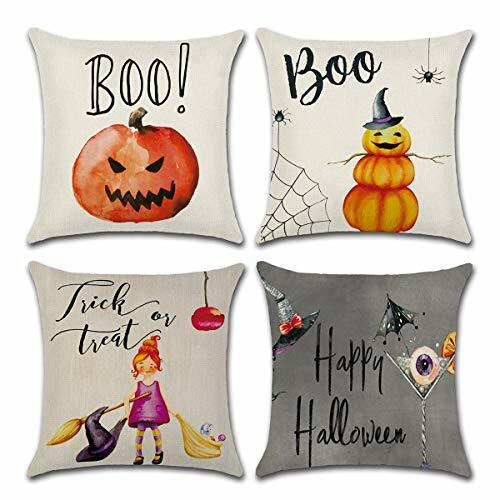 Suitable for decorate sofa, chair, bedside, and so on during Halloween. Increase the warm atmosphere of Halloween. ETERNAL HALLOWEEN ELEMENTS - Attractive pattern printed on front, the bat, pumkin, little witch . Decorate your home with this unique cushion covers. NO HASSLE MONEY BACK GUARANTEE - If anything goes wrong with your pillow covers, or you decide it is just not for you, We will always be there with you. Add the cart now and give your kids a surprise. If you have any questions about this product by Dreampark, contact us by completing and submitting the form below. If you are looking for a specif part number, please include it with your message.